Can you send me brochures/maps/etc? When is the best time to see the Fall Foliage? How can I get married in the State of Vermont? How do I add events to your Calendar? Select a subject so that we may better route your inquiry. Subject: Please select a subject I am interested in Advertising on Vermont.com. I have a comment about your website. I am interested in General Information about Vermont. When is the best time to visit Vermont to see the Fall Foliage? We are planning a trip to Vermont - Can you send me brochures/maps? What are the rules for Marriages / Civil Unions in Vermont? How do I add events to your Calendar and how much does it cost? I am interested in Investment Opportunities on Vermont.com. We are planning a trip to Vermont - Can you send me brochures/maps/etc? 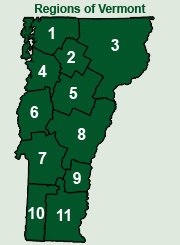 To help you decide which part of Vermont you'd like to visit, use the map in the upper right-hand corner of our site for a brief description of each region of the State. Some pages tourists find helpful when making plans to visit our beautiful State are our Calendar of Events, and our online Travel Guide. In addition to the Foliage Report, we also have a Golf Guide, and a Ski & Snow Report to help visitors plan their seasonal Vermont vacations. A few more pages that may help you in planning your vacation online are our Lodging, Dining, and Attractions pages. When viewing these pages, you can sort by the region you will be visiting with the map in the upper right-hand corner. If all else fails, the Vermont Department of Tourism should be able to mail some printed material to you. They can be reached at 1-800-837-6668. When you call, wait until the end of the recording to speak with a "live" person and tell them you got their phone number from VERMONT.COM. To request a Vacation Packet sent to you via mail, please visit the Vermont Department of Tourism. When is the best time to visit Vermont to see the Fall Foliage? The Fall Foliage Season usually begins around mid-September and lasts thru mid-October, with peak colors appearing around the first week in October. Of course this varies depending on the weather. The leaves start to turn in the northern part of the state first and gradually work their way south. Also, in general, higher elevations start changing before the lower elevations. Visit our Fall Foliage page for current conditions throughout the Foliage Season. Our "Guide to Vermont Weddings & Civil Marriage" should have the answers to all your questions. If you have questions that are not answered, contact your Town Clerk or the Vital Records Unit of the Vermont Department of Health at 802-863-7275 / 800-439-5008. When contacting them, please mention you found their information on VERMONT.COM. How do I add events to your Calendar and how much does it cost? The Vermont.com Calendar of Events is a FREE service that we provide for all events that take place within the state of Vermont. To add your event to our calendar, simply click on the "Suggest an Event" link on the main Calendar page.